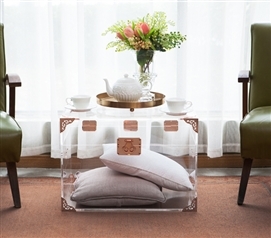 Trunks are a great way to create extra dorm room storage space in your cramped dorm room. The dorm trunk can be used to store anything from clothes and extra dorm bedding Twin XL, to books, or anything you want kept out of the way. 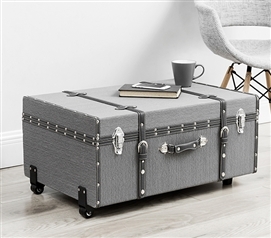 In dorm life college trunks can also be utilized as dorm end table or college nightstand, which makes it a true multi-functional dorm necessity. 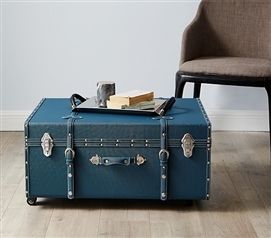 Another great use for dorm trunks is to use them to pack up everything you need for college. By getting the dorm trunk early, you can use it to store all the other college stuff that you'll need to gather before you take off for college. Complete your dorm room decor and add plenty of extra dorm room storage to your college dorm room with our VIN® Armored Trunks - Rouge Destination (Black). Keep your dorm room clean and organized with The Sorority College Dorm Trunk® in Ocean Depths Teal! Ciao Bella® Acrylic Trunk - Silver Plated Keep your seasonal clothes organized and add plenty of dorm room storage to your college dorm room with dorm storage solutions such as our VIN Armored Trunks - Alloy Gray. VIN® Steel Plated Trunks - Argent Destination (Silver) VIN® Steel Plated Trunks - Sommet Destination (Rose Gold) VIN® Steel Plated Trunks - Sommet Destination (Black Granite) Complete your dorm room decor and add plenty of extra dorm room storage to your college dorm room with our VIN® Armored Trunks - Rouge Destination (Caribbean Blue). Central Style® Cushion Bench - Farmhouse Wood with Shabby Chic Multi Stripe Cushion - Extended The Sorority College Dorm Trunk® - White Featured in O, The Oprah Magazine (September 2013 Issue, page 66) on The O List as a TOP Back to School Product! Keep your dorm room clean and organized with The Sorority College Dorm Trunk® in Dark Gray Stripe! The #1 way to pack up all your college supplies and to cart them off to your dorm room is with a college trunk. Also known as a dorm trunk or collegiate trunk these college products are a must have addition to any dorm room checklist. With the ability to hold your seasonal clothes, extra Twin XL Dorm Bedding and other dorm essentials, a dorm trunk simply makes packing up for college easy. Packing up your dorm stuff all 4 years of college is best when you have your trusty college trunk!